Beading Templates, Collar Patterns, etc. *Currency converter is for your convenience only. All orders are charged in GB Pound Sterling. Exchange rates may vary slightly. Make your own stunning amber and gold bead embroidered bauble with this full kit! 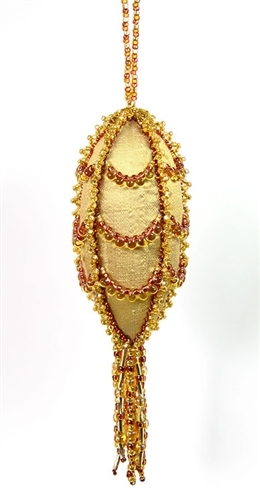 Includes a pre-stitched pure silk bauble, ready for you to stuff and bead PLUS everything else you need, except a needle and thread. Easy-to-follow instructions - suitable for complete beginners as no beading experience is needed. Simple step-by-step instructions with lots of clear colour photographs to help you. This kit is also available in Red & Gold, Purple & Gold or Blue & Crystal. 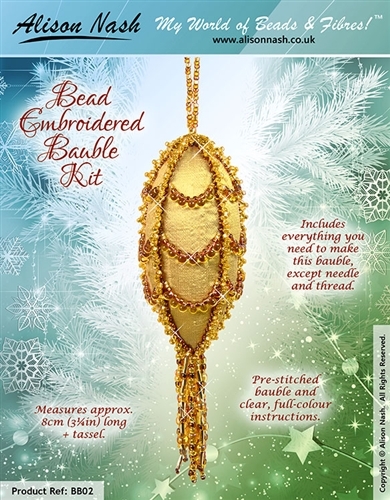 This kit is not for large commercial use, but you can make and sell up to 20 baubles per year. Copyright © Alison Nash. All Rights Reserved.